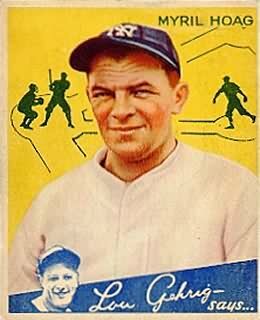 When outfielder Myril Hoag began his Yankee career, he competed for playing time with the likes of Babe Ruth and Earle Combs. By the time he completed it seven years later, he was playing behind names like DiMaggio, Selkirk and Henrich. Thus went the pinstriped career of one of the most effective fourth outfielders in franchise history, good enough to back up those who were better. Born in California, Hoag began his pro career in the Pacific Coast League and made his Yankee and big league debut in 1931. His best season in the Bronx was 1937, when he appeared in 103 games, had 109 hits and averaged .301. Hoag also put together a solid World Series against the Giants in 1937, starting all five games and batting an even .300. After the 1938 World Series, New York traded Hoag and back-up catcher Joe Glenn to the St. Louis Browns for pitcher Orel Hildebrand and outfielder Buster Mills. He finally got his chance to be a starting outfielder with his new ball club and took advantage of it, by averaging .295 and making the AL All Star team. That ’39 season proved to be his best. The Browns traded him to the White Sox and after his second season with Chicago, Hoag joined the Army. He was given a medical discharge a year later and ended up playing for Cleveland during the second half of the ’44 season and averaging .285 for the Tribe. That would be Hoag’s last hurrah as a big leaguer, though he’d continue to play in the minors well into his forties, finally hanging his spikes up for good after the 1951 season. He was only 63 when he passed away in 1971, a victim of an emphysema-induced heart attack. Hoag shares his March 9th birthday with this Yankee who hit one of the most famous home runs in franchise history, this former AL MVP, this recent Yankee reliever and one of the great base-stealers in MLB history. Clay Rapada signed with the Yankees as a free agent just as New York’s 2012 spring training camp was opening. His career up to that point had been mediocre. He had gone un-drafted out of college (Virginia State University) and then signed with the Cubs in 2002. He didn’t make his big league debut until five seasons later, in July of 2007. Six weeks after that debut he was traded to the Tigers. His real rookie season was 2008, when he appeared in 25 games for Detroit and went 3-0. He spent most of the following year back in the minors and in December of 2009 he was traded to Texas. He appeared in ten games for the Rangers in 2010 and actually made their postseason roster. 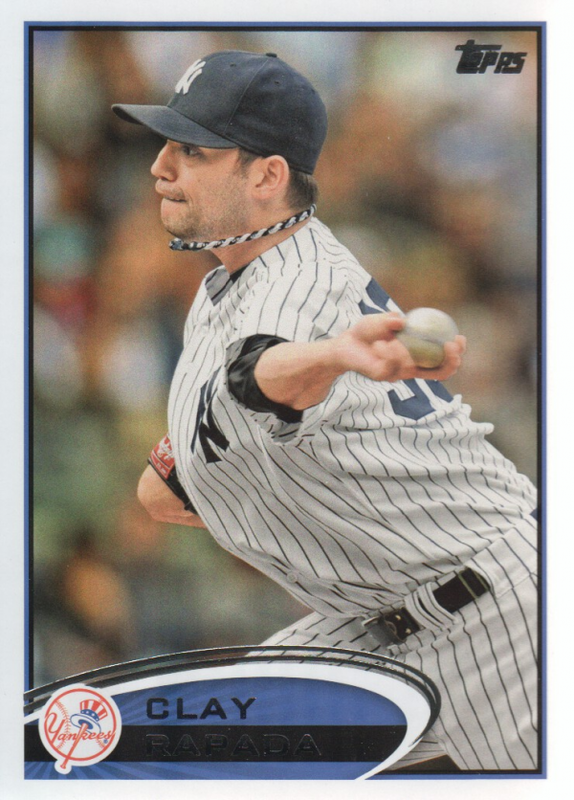 It was during the 2010 ALCS, when Texas defeated the Yankees that I first remember seeing the six foot five inch southpaw pitch with his extreme side-arm motion. Texas released him the following January and he was signed by Baltimore, where he appeared in 32 games for Buck Showalter and spent lots of time also pitching for the O’s Norfolk farm team. So the Clay Rapada the Yankees signed in February of 2012 was by then 30-years-old and had spent at least part of each of the previous ten seasons in the minors, with four different organizations. He had started his professional career as a pitcher with a traditional overhand delivery, who would occasionally drop down to sidearm if an opposing hitter kept fouling off his pitches. A coach in the Cubs’ system convinced him that converting full-time to the submariner style would improve his chances of getting regular work in a big league team’s bullpen. Rapada made the change, modeling his new motion at first off of Dennis Eckersley. One month after the Yankees signed Rapada, they acquired his mirror image, Cody Eppley off of waivers from Texas. Eppley was a right-handed sidearmer who had pitched with Rapada when both were in the Texas farm system. Together, this submarining duo would form the heart of Joe Girardi’s middle-inning relief corps. Rapada appeared in 70 games for New York during his first season in Pinstripes and Eppley appeared in 59. Rapada’s ERA was 2.82 and Eppley’s 3.33. Neither had ever pitched better and they credited their mutual success in part on being able to turn to each other for advice. The challenge most sidearmers have is that their teams’ pitching coaches are always retired hurlers who threw with traditional overhand motions. A traditional coach like the Yankees’ Larry Rothschild, can therefore not be of much help to Eppley or Rapada with their mechanics if their pitches stop doing what they are supposed to do. So having each other to serve in that role just might have been the secret to their success during their initial season together in the Bronx. As I write this post, Rapada is currently trying to recover from a case of bursitis in his pitching shoulder. One interesting sidenote on this native of Portsmouth, Virginia. He will begin the 2013 regular season having never lost a decision in the big leagues. Through 2012, he has a perfect 8-0 record. Rapada shares his March 9th birthday with this Yankee who hit one of the most famous home runs in franchise history, this former AL MVP, this former Yankee outfielder and one of the great base-stealers in MLB history. Jackie Jensen was one of the most celebrated Yankee signings in the history of the franchise. He had been a football and baseball star at the University of California, becoming the Golden Bears’ first thousand yard rusher in 1948, just one year after leading the school’s baseball team to the first ever College Baseball World Series title. Placed on academic probation, Jensen quit school in his senior year to play baseball with the American Association’s Oakland Oaks. After just one season, the contracts of Jensen and his Oakland teammate, Billy Martin were sold to the Yankees and New York’s front office began predicting that Jensen would replace Joe DiMaggio as the team’s starting center fielder when The Yankee Clipper was ready to retire. The new golden boy was put on New York’s big league roster and when he was called on to pinch run during the 1950 Fall Classic against the Phillie Whiz Kids, he became the first athlete in history to appear in both the Rose Bowl and the World Series. In 1951, DiMaggio’s final year in pinstripes, Jensen got into 56 games for New York and batted a respectable .298. But DiMaggio’s farewell season was also the rookie campaign of Mickey Mantle and suddenly Jensen was no longer the answer to the question; Who would become the next great Yankee center fielder? Instead, he was traded to the lowly Senators for outfielder Irv Noren at the beginning of the 1952 season. You’d think at the time, the Yankees would have considered keeping both Mantle and Jensen and they probably did. They already had two solid veterans, Gene Woodling and Hank Bauer surrounding Mantle in the outfield. In addition, Jensen was a right handed hitter and Yankee Stadium was not a friendly place for players who swung from that side of the plate. The team also had a young Bob Cerv on the bench so Yankee GM George Weiss probably figured the veteran left-hand-hitting Noren would give Stengel more options than keeping the relatively untested Jensen. 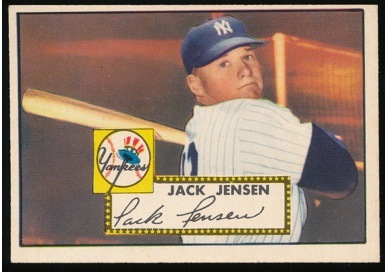 But it sure would have been fun to have the Jackie Jensen who became one of the American League’s best run producers and outfielders for Boston in the late fifties, playing alongside Mantle during their peak years. Jensen culminated his career with the 1958 AL MVP award. He would probably be in Cooperstown today if his crippling fear of flying did not induce him to retire after the 1959 season. He tried coming back in 1961, aided by a hypnotist to overcome his phobia but he was not the same player. His last big league game was in 1961 in Yankee Stadium on the day Roger Maris hit his 61st home run. Jensen passed away in 1982, when he was only 55 years of age. 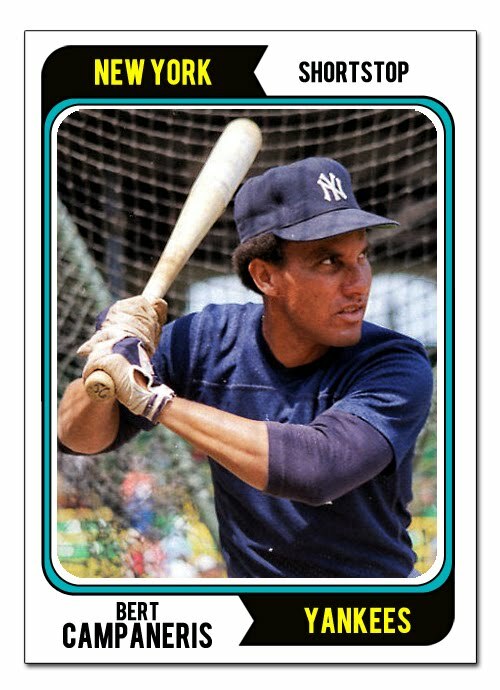 This former Yankee who also celebrates his birthday on March 9th, hit one of the most famous home runs in franchise history. So does this shortstop who captured six AL stolen base titles during his career. This sidearming southpaw and this former Yankee outfielder were each also born on March 9th. When I think about Boone two things immediately come to mind. The first of course is the home half of the 11th inning of the seventh and final game of the 2003 ALCS, Red Sox versus Yankees in the Bronx. Score is tied, 5-5 with Boston knuckleballer Tim Wakefield on the mound as Aaron Boone steps into the batters’ box to lead off the inning for New York. His brother Brett is doing the game for Fox in the booth. I absolutely knew that Boone was going to hit a home run off of Wakefield and when he did, against the hated Red Sox and I got to see it on my television set, it just does not get any better than that for die hard Yankee fans like me. The next thing that comes to mind when I think about Boone is the famous line from the movie, The Godfather II, “This is the business we chose.” Boone’s whole life, his whole heritage had been baseball. His grandfather, father and brother were all Major Leaguers. He had just hit one of the most famous home runs in the history of the most famous sports franchise on earth. 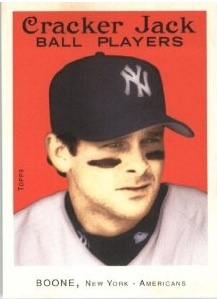 He was the starting third baseman for the AL Champion Yankees. He was at the peak of his playing career when he made the decision to play some pick-up basketball during the off-season and ripped apart his knee. In what seemed like a blink of an eye, the Yankee front office went out and got A-Rod and dropped Boone like a lead weight. Talk about going from the thrill of victory to the agony of defeat in record time, Boone’s odyssey was unbelievable. But the guy took it with grace and professionalism every step of the way. I will always be a fan of Aaron Boone. Always! This former AL MVP, this sidearming southpaw and this six-time AL stolen base champion all share Boone’s March 9 birthday.